Peter Som is becoming the new Derek Lam this year, and his Spring 08 collection definitely places him as one of the top designers to pay attention to. "Som's pretty women were both sugar and spice," says Anne Bratskeir of amNY. His runway was filled with models who can do both cute and sultry. To mention a few, Jessica Stam, Coco, Sasha and Chanel were struting the catwalk on Sunday. 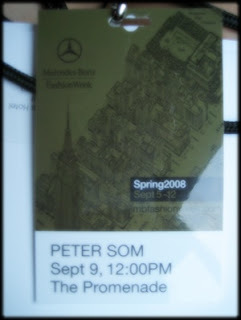 So who got the front row seats at Peter Som's show? Try the infamous socialite, Tinsley Mortimer, Maria Sharapova, and Peter's oh-so-adorable parents.